Though it’s billed as “Return to Glory”, Saturday does not signify an American heavyweight renaissance. Those of us who tasted the Tyson or Ali eras, and thus have an idea of what an exciting division feels like, won’t have our sufferings eased by Bermane “B.Ware” Stiverne’s WBC title defense against Deontay “The Bronze Bomber” Wilder. Neither man has an exceptional pedigree and, like most heavyweight eras, this one is weak. But while these points are inarguable, it shouldn’t diminish anyone’s excitement for the fight. The critics and nay-sayers should put aside their pessimism. Stiverne vs Wilder is a fun stylistic clash that will end in unconsciousness. Deontay Wilder, the true B-side, is being treated like the A-side because he’s American and exudes the charisma the laconic Stiverne lacks. He dances, he boasts, he has a genuine human interest story, and he drives a garishly-styled car that features a painting of his face on its door. He also knocks people out. In fact, he knocks out every one he fights, to the tune of 32 stoppages in 32 bouts. One of these stoppages left Siarhei Liakhovich twitching on the ring apron in a macabre display of Wilder’s power. The Alabama native’s right hand packs the force of a Gulf Coast tidal wave. Wilder is an imposing physical specimen. Results are often a function of circumstance, though, and “The Bronze Bomber” hasn’t beaten anyone good. Last year he was supposed to receive a test against Malik Scott, but Scott, perhaps paralyzed by the same fear that doomed Bruce Seldon against Mike Tyson, was stopped with extraordinary ease by a flush left and an imprecise right. Wilder’s trainer recently told Showtime, “It’s not that his opponents aren’t good. They’re good. Deontay’s just better.” Deontay might be better, but better than bad isn’t necessarily good. While it’s indisputable he can punch, which is a serious asset, we have no idea whether he can handle getting punched back. 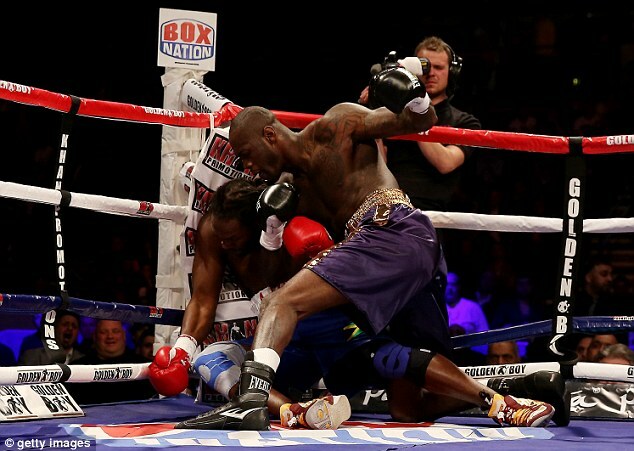 Wilder, seen here destroying Audley Harrison, has great power but is still green. 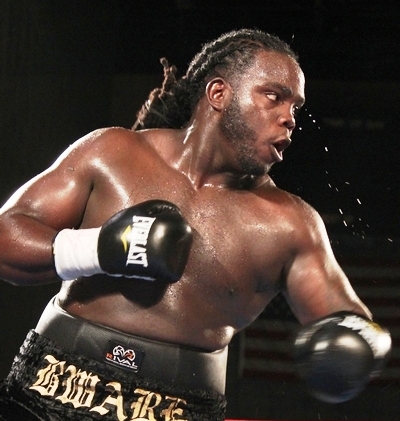 Bermane Stiverne has had his chin checked, and though he’s been stopped once he can box his way through a storm. 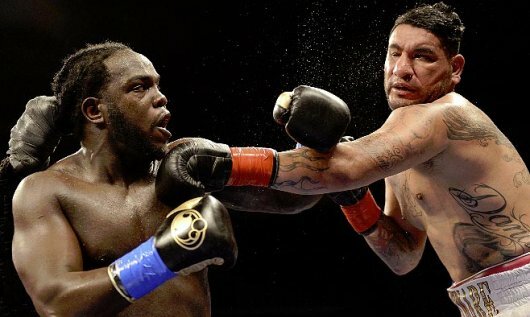 But Wilder punches harder than Chris Arreola, so if Stiverne’s sometimes-porous defense allows for a sustained beating, the first Hatian heavyweight champ could be in trouble. But as always, “if” is the operative word. Wilder will be successful only if he uses his reach advantage; he is officially five inches taller and his arms are three inches longer. Wilder’s left is what did in Malik Scott, but if Stiverne uses head movement to evade Deontay’s jab he’ll get inside those long arms. An intelligent fighter with good skills and a sneaky, powerful right of his own, Stiverne won’t walk into one of Wilder’s bombs, but instead make the “Bomber” work for it. While Wilder has been criticized for his poor competition, Stiverne hasn’t marched through a gauntlet either. He’s in this position because he beat Chris Arreola in consecutive fights. In their first meeting he smashed Arreola’s nose in the 3rd round and then outboxed the Californian for the remainder. In their second meeting he endured a vigorous attack and then decisively stopped Arreola in the sixth round. His other victims have had less impressive careers. But while it’s easy to point to each man’s modest résumé as an indictment of why Stiverne-Wilder doesn’t matter, it’s equally true they’re products of their times, and the heavyweight wellspring has long wanted for talent. 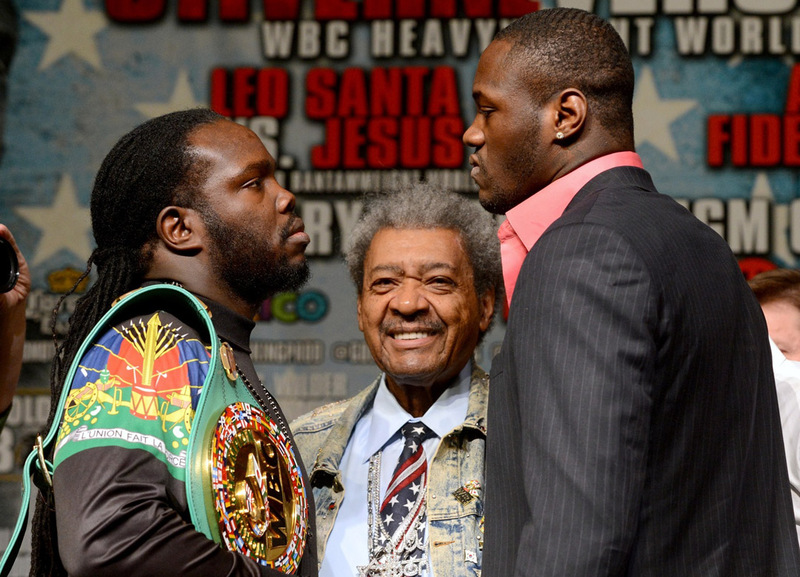 Stiverne: comfortable doling out brutality. Because of the two-headed Klitschko dominance, the division has been unappealing for North Americans for almost a decade. Stiverne is an interesting case. Born in Haiti, where he lived for his first ten years, he moved to Miami and then Montreal, where he began to box and discovered he had a talent. Now he lives in Las Vegas or Fort Lauderdale, depending on what media outlet you believe. Like Lennox Lewis before him, Stiverne is a man of many passports, and if you’re from everywhere, your home, ultimately, is nowhere. In Quebec, where home grown stars mostly receive the province’s full support, Stiverne lacks the profile of Jean Pascal or Adonis Stevenson. He has only fought here twice, scoring first round knockouts over forgettable competition. It is unfortunate Montreal has not claimed him for its own because geographical referents enhance a fighter’s identity. Like Stevenson, Pascal, Dierry Jean, and a host of other Haitian immigrants, Montreal is where he first put his fists to work. It would be gratifying if his association with the city worked for him. In advance of this contest, Wilder has said much and Stiverne comparatively little. “B.Ware” is not as comfortable in front of the camera. He can be thoughtful and is usually genial, but words do not come in the abundance they do for the Alabaman, who has an endless supply of lines, and sometimes even rhymes. 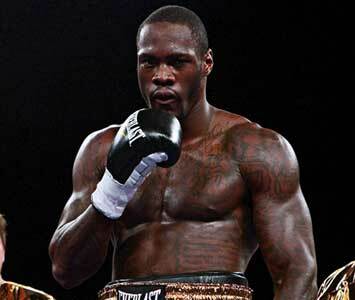 Bermane secured his WBC belt with a knockout of Chris Arreola. But behind Stiverne’s relaxed demeanour is a competitor comfortable dolling out brutality. In advance of his fight with Arreola, Stiverne vowed to cut his head off. He has promised similar pain for Deontay Wilder. “I’m not going to just knock him out; I’m going to hurt that kid,” he said, echoing the boasts of a thousand other big men. I get the sense that Stiverne is genuinely relaxed in advance of this showdown. He’s fought in a pressurized environment before and perhaps feels Wilder’s rawness is ripe for exploitation. Wilder’s right hand can end a fight at any moment but I think his hammer will miss its nail. Picking against someone with that much power involves faith in the other man’s skills. Stiverne’s superior infighting will make Wilder uncomfortable and the Haitian’s right hand will crush Deontay’s delicate-looking jaw. My pick: Bermane by sixth-round knockout. Like a lot of people, you were wrong about this one. I really hope Wilder stays active. He said he would, but we all know it’s not up to him. I was dreadfully wrong. It was a strange fight and Stiverne didn’t use his strengths to his advantage. Had he, I still think he would have won. And then, oddly (or predictably? ), it emerges afterwards that he was sick the entire time. Who knows? (Not me.) The bad thing about being a belt holder is that your activity doesn’t exactly pick up when you’re near or at the top. There are few guys for Wilder to fight, although I’d love to see him in there with Fury. At this point, Klitschko is still way too experienced and skilled for him, and will probably always be. Anyway, thanks for reading.